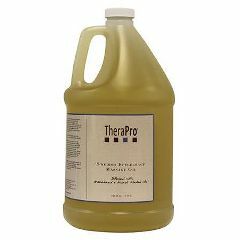 TheraPro Swedish Effleurage Massage Oil is used for Effleurage and Swedish massage modalities. This is a luxurious blend of natural grapeseed, and almond oils with Vitamin E. Provides a silky smooth glide and excellent absorption, which leaves the skin feeling very soft and moisturized. Naturally water soluble, it cleans up easily and washes out of sheets without leaving an unpleasant odor. Unscented. Available in 8 oz, 1/2 gal, and 1 gal sizes. Under normal conditions the shelf life is at least 2 years. Note: Pumps sold separately. Pumps available for and . Pump for 1/2 gallon may need to be cut to size. *Please Note: The odor experienced is attributed to one of the raw materials/ingredients used as a neutralizer during manufacturing process. Since these formulas are unscented, ie: no fragrances added, this smell often becomes the most prevalent scent in the product. The product has passed all quality inspection guidelines and requirements for safety and performance.